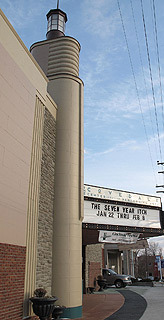 The shining star in arts and entertainment in Price Hill is the Covedale Center for the Performing Arts, a live, professional theatre with a focus on local talent. The Center began in 1947 as a popular post-war theatre and has changed faces over the years, including a temporary life as Cinema Grill, a diner showing second-run shows. In 2001, the Cincinnati Young People's Theatre was able to purchase the Center after a vigorous campaign by community action groups, and since then have produced many well-known musicals and plays, such as West Side Story. Sunset Players, a community theatre group established in 1979, does three major productions plus a children's theatre show every year, often at the Dunham Recreation Center Arts Building. Price Hill Will also has a Arts and Culture community action team (CAT) with a focus on the fine arts. They organize free community concerts as well as educational programs, such as "Take a Closer Look," which provides opportunities for young artists to learn about the architecture and history of Price Hill. Price Hill recreation is varied and plentiful. The neighborhood has some wonderful green space, including a panoramic view of the city from Mt. Echo Park. 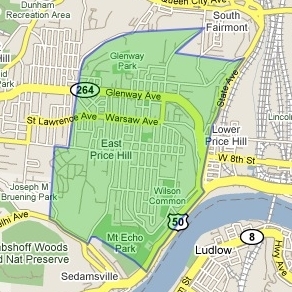 Glenway Park and Dunham Park offer athletic fields and play equipment for kids. Price Hill also boasts one of the Cincinnati's most outstanding nature preserves, Imago Earth Center, which consists of 16 acres, and is home to three distinct ecosystems and many sheltered species, including owls, deer, salamanders and coyotes. Imago, which also hosts ecological study groups and summer camps for kids, is located in the Enright Ridge Urban Eco-Village, close to the 100-acre Wood and lots of hiking trails. Another nature preserve of note with forest area and trails is tucked away next to Quebec Heights Elementary School - called the USA Land & Water Conservation Fund Project. The Dunham Recreation Complex has a brand new Aquatic Center, offering swim lessons, a swim team, a program for junior life guards and also a golf course with a 9-hole practice green for all skill levels. The Price Hill Recreation Center hosts after school drop-ins and day camps, quilting, ceramics and bingo, as well as aerobics classes and a full-sized gym, with organized basketball and volleyball leagues for different ages and skill levels. Those interested in martial arts can hone their skills at Tai Chi Kung Fu or Price Hill Boxing Club.